There’s a reason we’ve seen a menagerie of quadcopters over the past few years – the key piece of any quadcopter build is an inertial measurement unit. Historically a very complicated and expensive piece of kit, these IMUs came down in price a few years back, allowing anyone with a few dollars in their pocket and a handful of brushless motors to build a four-bladed drone in their workshop. [Starlino] built a few quadcopters, but he wanted to shy away from IMUs and get most of the mass of his new ‘copter over the center of the chassis. He came up with a design he calls the quadhybrid that can be built out of a quartet of those cheap 3-channel helicopter toys. Most of the lift for [Starlino]’s quadhybrid comes from a pair of coaxial rotors from a Syma 001 3-channel helicopter toy. Anyone who has played with one of these toy helicopters knows how stable they are; if the tail rotor breaks, you’re left with a helicopter that can only go up and down. 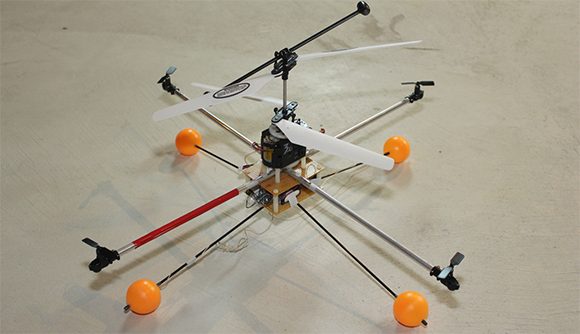 To give his quadhybrid a few degrees of freedom, he attached four tail rotors from 3-channel helis to a few booms laid out in a cross pattern. By taking the receiver out of a 4-channel helicopter and adding his own controller board, [Starlino] made each of the tail rotors control the pitch and roll of the craft. In the video after the break, you can see the quadhybrid is amazingly stable even without an IMU and surprisingly agile. As [Starlino]’s ‘copter can be made out of replacement parts for cheap 3-channel helis, we’ll expect a rush on these tail motors at your favorite online RC retailer very shortly. Nifty design on the machine but horrible music in the video. The gear noise is very loud. Sounds like something isn’t meshing properly, could be gears too far apart. Hmm. I don’t see how it’s really much better than the 3ch heli that it was derived from. You are not gaining any lift, that’s for sure, the small tail boom motors are TINY. I have one of those machines, and like this, it’s really indoor only, the slightest breath of wind and voooom it’s gone, the small tail rotor* simply does not have enough power to overcome any head wind. That was the main problem with it. Otherwise, it was easy to fly, had quite good amount of lift, and was very strong, it took me a couple months of crashing it into walls and ceilings and floors and tables and … before I broke the blades and lost interest. Now, maybe if you mounted 4 of the main rotor assemblies ripped from helicopters, and had a larger “boom” assembly to induce the pitch. You might have something. Hmm. I wonder how cheap some small helis can be bought on ebay. * For those unfamiliar with these toys, the “tail rotor” is mounted horizontally and works to cause a pitch moment, not to counter torque like with a normal helicopter. The pitch (forward or aft) induced of course causes the main blades (which are counter rotating) to direct the lift they are producing, and cause forward or reverse flight. Indeed. I’m surprised the main rotor has enough in reserve to lift four booms. I don’t quite understand why he needs four to do this. Would two not suffice as they’re reversible? The tail boom rotors aren’t intended to add any lift at all, only to tilt the ‘copter to provide maneuverability. [Starlino] claims that having the lift provided from a central, coaxial rotor, increases stability over having to synchronize lift from four rotors around the periphery. And it seems to be working. I like the design overall. Though I agree with [James] the smaller rotors may be too weak to keep the ‘copter stable in anything but the slightest outdoor winds. But on the flip side, due to their low inertia they’d be able to respond very quickly to feedback from an IMU. An advantage that is not currently being taken advantage of, so I’d really like to see what it can do with an IMU! I’ve also been wondering if combining multiple center-rotors in a ‘tertra’ or ‘quadro’ design could improve lift, particularly the amount of extra weight you can add (extra electronics, batteries? etc.). I think you just found the reason this is better than the 3ch heli. A quadracopter doesn’t take months of learning to control. They are very stable right off the bat. Assuming your IMU is programmed correctly. Unless you don’t need one, as in this case. These gyro stabilized mini copters are extremely vertically stable. I like this takeoff on a quadcopter, but I’ve dreamed of adding a vectored thrust fan for directional control. Just been waiting for the right parts to show up. Then, I believe the little bugger could handle some outdoor breezes. If you want a small quadcopter nothing beats the $20-$30 ones on eBay. Just search for small, nano, or tiny Quadcopter and you will find them. They are uneatable, because they are super quick and can do flips in any direction! Also has stunt mode making it even faster. only bad thing is short flight time, but they all have that.